iOS users know the Dock as the space at the bottom of the screen where a select number of frequently used apps live. Historically, the Dock on iOS has been relatively featureless – it allows you to quickly access your favorite apps from any navigation screen, but nothing more. But with the changes coming to iOS 11, the iPad's Dock is getting upgraded to more closely resemble its macOS counterpart, with a few special multitasking benefits to boot. The first change worth noting with the iPad's new Dock in iOS 11 is that it can hold a lot more apps than before. Similar to the Dock on macOS, now the Dock can feature a screen-wide assortment of your most important apps. This is supplemented by a new predictive area on the right-hand side of the Dock, which offers suggestions based on what app it believes you'll want to launch next – including Continuity apps. Besides its added space for more apps, the iPad's Dock is also more accessible than ever before. No longer confined to your Home screen, the Dock can be invoked while inside any app by sliding up from the bottom of the screen – a gesture formerly assigned to bring up Control Center. This provides quick, easy access to all of your most-used apps systemwide so you can switch apps without needing to return to the Home screen. In addition to providing a quick way to switch apps, the Dock also allows you to engage in multitasking by dragging an app directly out of its docked icon and on to a select portion of the screen, effectively opening the second app in Slide Over. Once this second app is floating above your primary app in Slide Over, you can tap and hold it to drag it along a horizontal plane – it can either come to rest on the right or left-hand side of the screen. If you'd like to make that app a permanent fixture on your screen, you can choose to have it lock into Split View on the side of the screen where you placed it. For all apps found in the Dock, this is a tremendous upgrade in multitasking behavior over the previous app picker, enabling quicker access to the right apps and more flexibility in the way you configure those apps – including options for the app on either side to be in 1/3 or 2/3 view. The multitasking features of the Dock join with a newly redesigned App Switcher to provide even greater multitasking improvements over past versions of iOS. When sliding the Dock up from the bottom of the screen, if you continue dragging further upward, you will invoke the new App Switcher. This redesigned App Switcher can contain not only other apps, but also app spaces. Similar to the spaces found in macOS, any screen setup of two apps side-by-side can be saved as a space in the new App Switcher, allowing you to create custom screen setups for different tasks on the iPad. The App Switcher is also, interestingly, now home to iOS 11's redesigned Control Center. Overall, the iPad's new App Switcher shares a lot in common with the Mac's Mission Control feature, and it works well in its iOS form. iOS 11's updates to multitasking seem to provide iPad users exactly what they've long hoped for. The Dock is a clever importation of a familiar Mac concept, and the new App Switcher is sure to make iPad power users quickly forget about its unfortunate predecessor. Multitasking on iPad has new and greatly improved days ahead. Touch screens have long provided a more intimate form of interaction with content than is possible using a trackpad and cursor. Yet despite that, the ability to intuitively drag and drop items across different apps has been lacking on iPad, the touch device best suited for it. That changes in iOS 11, with robust drag and drop support offered in a touch-enhanced form. In its keynote presentation, Apple showcased drag and drop being used to do things like move images, text, and URLs between different apps – and in more ways than one. The simplest method is simply to tap on content and drag it from one app in Split View into the app on the other side of your screen. But the feature can also be used to drag content from an app on screen into an app that isn't currently on screen. This can be done by bringing up the new App Switcher and dragging your content into an app that resides there. 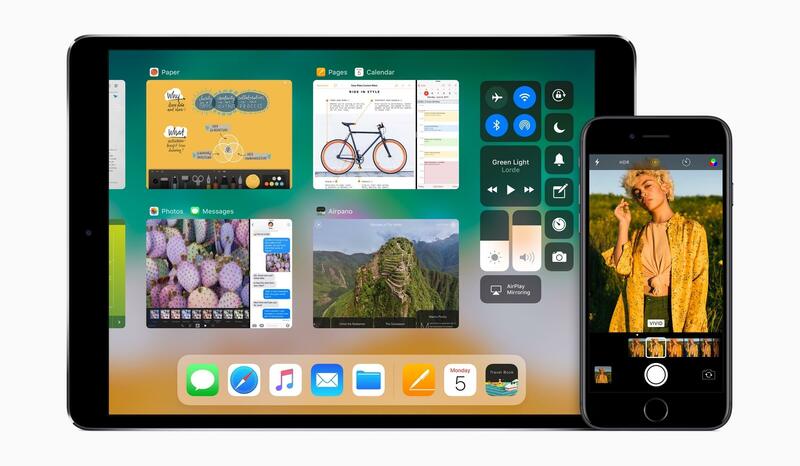 The richness of dragging and dropping content across not only current apps, but also those in the App Switcher, is made possible thanks to drag and drop's multitouch support. With multitouch, you can select some content, then use other fingers or your other hand to select additional content, and pull up the Dock or the App Switcher to navigate to wherever you'd like to drop that content – all in one swift action. 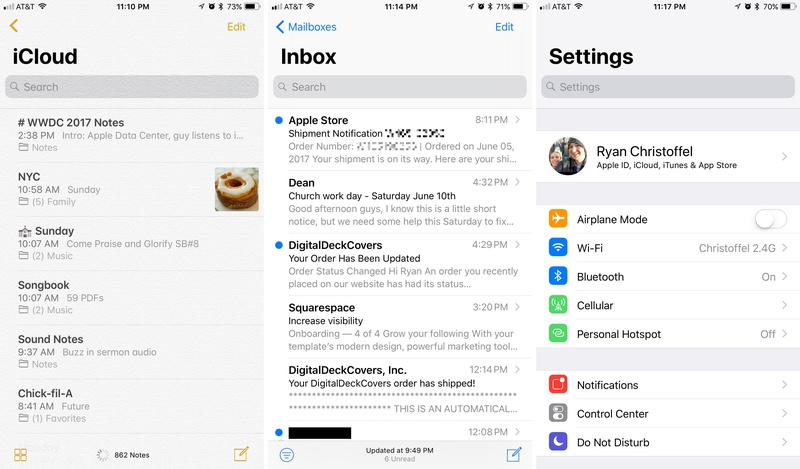 Despite being one of the more impressive technical achievements in iOS 11, there isn't a lot else to say about drag and drop right now other than that it's here, and it looks fantastic. 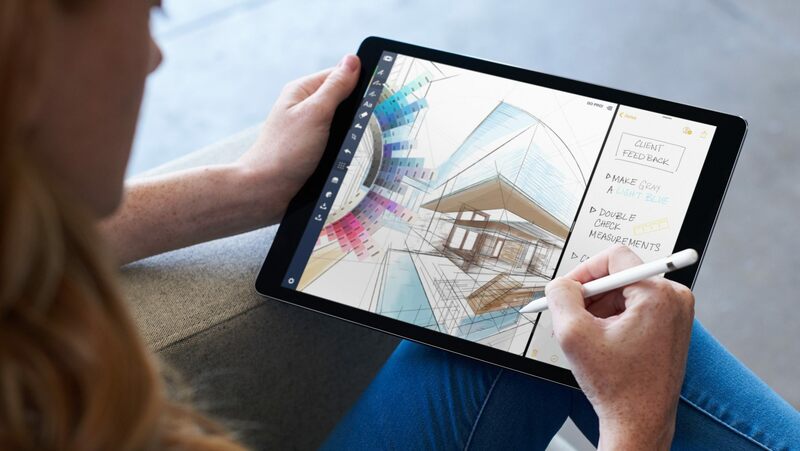 Time and testing will provide more details on the specifics of its implementation in iOS, but assuming it works as advertised, Apple has created an elegant, intuitive, and capable method of drag and drop that's perfectly suited for iPad. File management on iOS has a new name: Files. 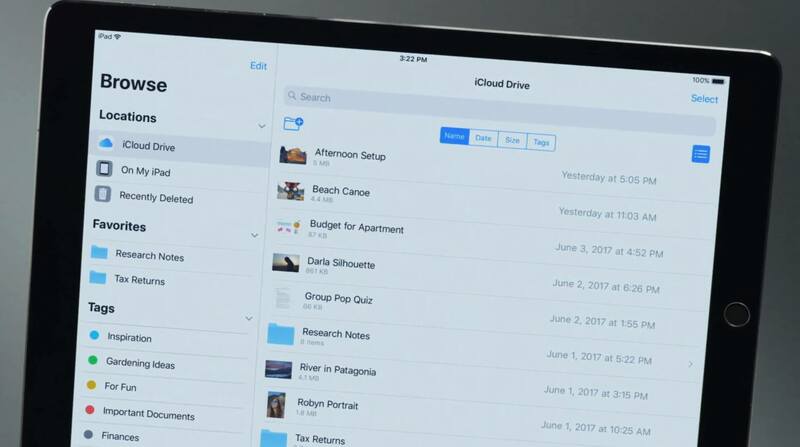 Gone are the days of the iCloud Drive app; it has been replaced by the more powerful Files, which resembles macOS's Finder in the way it provides rich organization tools and can integrate with third-party cloud storage providers like Dropbox, Google Drive, and more. Files is truly a Finder equivalent on iOS – and then some. As I mentioned, you can set up all of your third-party cloud services inside of Files, making it a unified hub for all file management needs. Every file you have, across all your cloud providers, accessible in one place. This unification of files benefits from the new Recents tab of the app, which shows all of the most recently updated files across the entire Files app, no matter which providers those files come from. Another highlight of Files is its expanded organization tools. Unlike the iCloud Drive app, Files includes support for tagging files – a feature macOS has had since El Capitan. It also includes a new Favorites section where you can keep any folders you need quick access to. There is also an expanded line of options for sorting or filtering through files, making it easier to find what you need. One way that the Files app takes advantage of drag and drop is that if it's in your Dock, you can tap and hold on its icon to view a handful of your most recent files, each of which can be picked up and moved into another app. Files also features rich drag and drop support for selecting multiple items at once, and moving them around into different folders or tag assignments. Apple has long been resistant to the idea of adopting traditional approaches to file management on iOS. The previous iCloud Drive app merely served as a half-baked, limited imitation of the Mac's Finder. I'm thankful that the company has changed course and provided a rich, powerful solution like Files on both iPad and iPhone. Implementing a system that's more familiar to legacy options should make it easier for more people to transition from Mac to iPad, should they desire to do so. Rounding out the iPad-specific improvements in iOS 11 are enhancements to the Apple Pencil and the software keyboard. 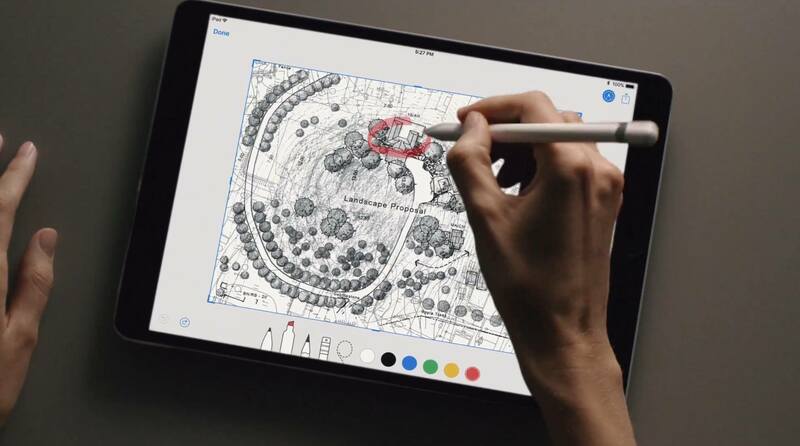 The Apple Pencil is now more deeply integrated into a number of areas across iOS. Paired with the new Create PDF system-wide action extension, Instant Markup is a powerful tool to easily annotate content from a variety of apps. The Markup feature found in iOS 10 has been upgraded with more tools that mimic those found in Apple Notes' sketching feature, and it's more streamlined too. With Instant Markup, there are less taps required to annotate a document – simply press the Pencil to the screen and mark away. Instant Markup is especially helpful when you want to annotate a screenshot. By default, after you take a screenshot in iOS 11 that screenshot's thumbnail will appear at the bottom of the screen. Tapping the thumbnail instantly loads it in Markup mode. Apple Notes is home to several of the Pencil's other new powers. A feature called Instant Notes allows you to simply tap your Pencil on the iPad's Lock screen to unlock it and begin taking a new note. 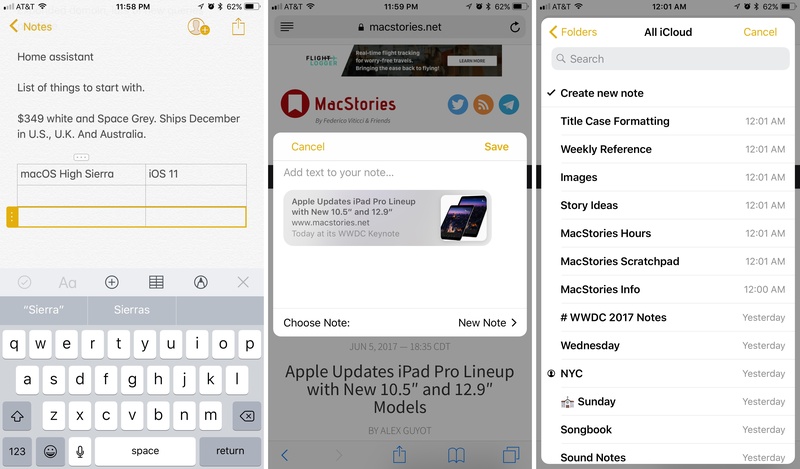 Handwritten notes are now searchable as well, making Apple Notes a solid option for storing both typed and handwritten text. Another Notes feature that relates to the Pencil, though only indirectly, is that Notes now has a Document Scanner so you can scan paper directly into the app, then annotate with the Pencil if needed. A final Pencil feature in Notes, which is also available in Mail, allows you create inline drawings – typed text will move out of the way to make space for your drawing. The iPad's software keyboard has been improved through consolidation.2 Now letters, numbers, symbols, and punctuation marks live on the same keyboard. This is accomplished by putting two options on every key. The primary button input is in black, while secondary input options appear at the top of each key in light grey; flicking down on a key triggers its secondary option. Alex: Every iOS revision to date has included improvements to a grab-bag of system applications, and iOS 11 is no different. While there are definitely a few regulars that Apple seems to enjoy toying with as design and interface playgrounds, the rest of the batch are generally a mystery until keynote day. This year we saw a fairly standard batch for the most part, but with a few unexpected contenders making appearances — such as the App Store app and a new Apple Pay iMessage app. 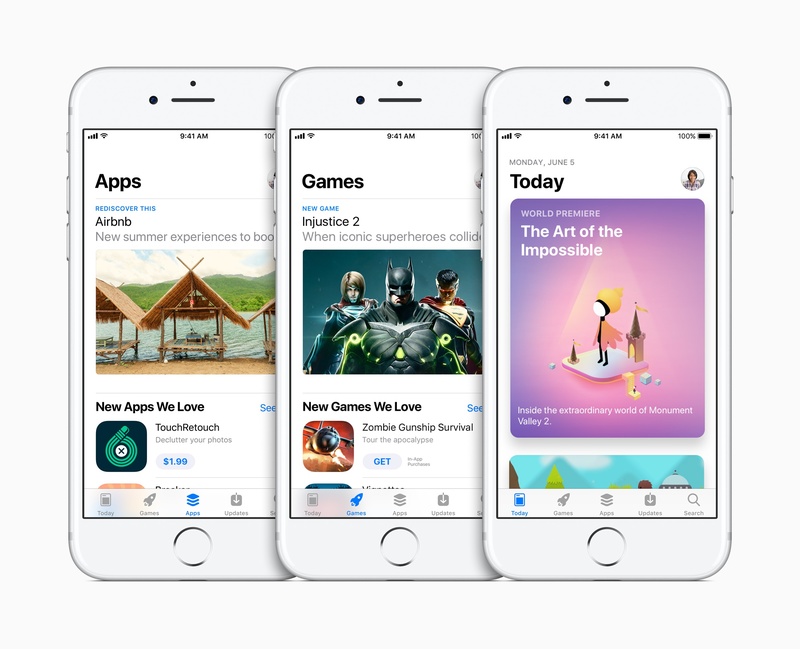 The App Store received the biggest change this year, with a full-scale redesign to match the design language that was pioneered by the Music app last year. A series of five tabs at the bottom divide the app into its main sections, with the primary tab being the new "Today" view. Today is a new take on featured apps in the App Store, where Apple can choose new apps to highlight each day and include individual editorials for them. The view is made up of a horizontal stack of cards that can be scrolled through — each card showing artwork for the featured app in question. Tapping the artwork will bring up an editorial that Apple's team has written discussing the app, such as a story about a moment in a game or a how-to article describing how to use an advanced feature. This is a fresh take on featured apps which Apple hopes will bring back some of the fun of discovering great new apps in the App Store. Beyond the Today section are sections for Games and Apps, which have thankfully been split apart into two different categories. This could potentially help to cut down on Games utterly controlling the App Store market in recent days, but we'll see how it plays out over time. From what we can see so far, these two sections seem to be where Apple is moving the featured sections that used to make up the front page of the old App Store. The last two tabs are familiar: Updates and Search. While Updates doesn't have any noteworthy changes, Apple is boasting a new "enhanced search." Supposedly this will allow apps to be discovered by more than just their name or any keywords their developers have bought ads against. The example on Apple's new App Store preview page shows a search for "geometry puzzle" finding the newly released (!) Monument Valley 2. Overall, the "all new design" of the App Store seems a bit underwhelming to me, but I do see legitimate potential in the new Today section. Editorials around apps is something we love here at MacStories, so we're excited to see Apple's take on writing interesting pieces about new apps. In iOS 11, Apple's Maps app will be seeing three big new features: indoor maps, lane guidance, and speed limits. All of these are welcome additions, continuing to close the feature gap that Google Maps still maintains over Apple. Indoor maps are launching for shopping centers and airports at first, and will show detailed views of where shops and terminals are located, including what floor they're on. This feature is launching in a small selection of cities at the start, but Apple says they'll be expanding it over time (similar to their flyover feature from a few years ago). Lane guidance is a feature that Google Maps already has strong support for, and I'm very excited to see it come to Apple Maps as well. With this addition, Maps will not only instruct you on which roads to turn on, but will actually inform you which lane you need to be in when approaching your next exit or fork. When driving on unfamiliar freeways this can greatly improve your ability to navigate without missing any important exits. The speed limit feature is also a welcome addition — and pretty much self explanatory as to why it's useful. If you've ever asked or thought the question, "What's the speed limit right now? ", then you know why this could be helpful. The biggest new feature for Messages is syncing with iCloud. Finally we can say goodbye to our Messages failing to sync their order or sometimes failing to come through at all when we switch between devices. Furthermore, deleting a message on one device now deletes it from all of them, another welcome addition. Naturally, the syncing is all still end-to-end encrypted. 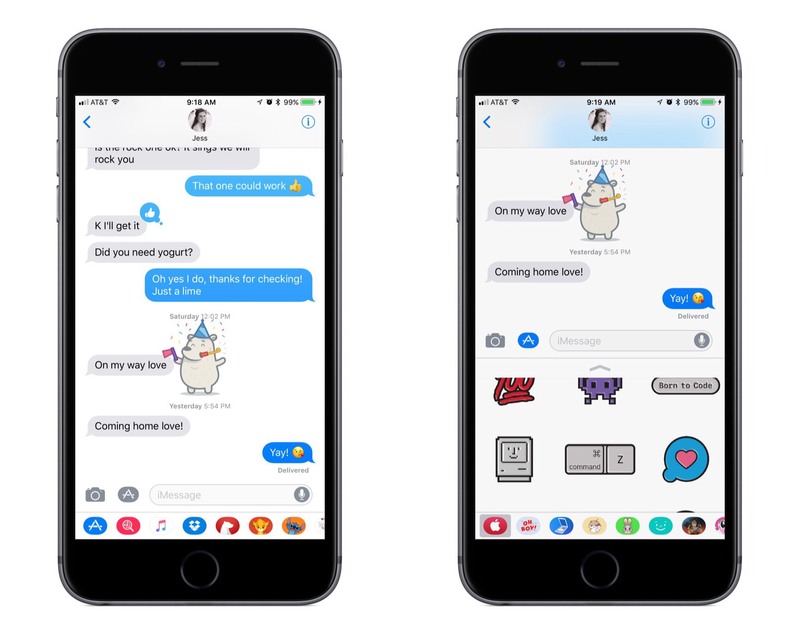 Beyond syncing, Messages is also getting a slight UI tweak for iMessage apps. An iMessage app bar is now instantly visible at the bottom of the screen when you open a new conversation, requiring fewer taps to access the apps, and also will likely make it harder to forget they're there like I often do in the current interface. One final note that goes in the low-hanging fruit category: Digital Touch has lost the prominent placement it previously held in Messages, demoted to simply being an iMessage app now. Apple is adding a brand new iMessage app of their own: Apple Pay for iMessage. This iMessage app enables person-to-person payments via Apple Pay for the first time. Simply open the iMessage app in a conversation and enter an amount, then hit send and authenticate with Touch ID to pay. I think this will be a great new way to easily transfer money — and will eliminate the hesitancy people sometimes feel about giving their credit card info to some of the other payment solutions that are popular these days, such as Square Cash and Venmo. Apple's Camera app has seen some love in iOS 11 as well. The app includes new filters to improve portrait photography, including advancements in low light photo quality. New compression technology also allows the photos taken by Camera to be stored at half the size without degrading quality. The aspect I'm most excited about are some of the new features around Live Photos. These include the ability to select a different frame of the Live Photo as the main frame, something which was not previously possible. There are also new features to turn your Live Photos into GIFs. Apple tries to do this intelligently and automatically, so you just need to choose an effect and iOS takes care of the rest. These effects include infinitely looping GIFs, "bouncing" GIFs, and infinite exposures (this just fuses the whole photo like a long exposure, it doesn't make a moving GIF). In the Photos app, Apple continues to bear down on their machine learning initiative. Now the app will create more "Memories" based on events like birthdays, anniversaries, compilations of your pets, etc. These Memories will also automatically adjust to fill the screen whether you're watching in portrait mode or landscape. 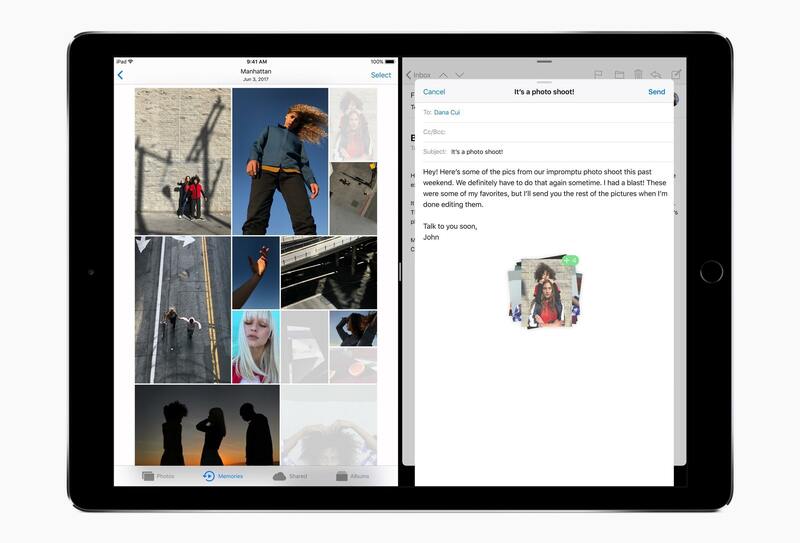 In terms of interoperability, Photos will now sync your metadata between devices. No longer will the work you put into confirming people's faces and names be wasted each time you pick up a different device. The News app will now contain daily curated content from Apple News editors in a new Spotlight tab, as well as a selection of the day's top videos from around the web. Other than that, the News app has gone mostly unchanged in this version of iOS. Apple may have failed to gain traction with their music social networks in the past, but that never has and seemingly never will stop them from trying again. 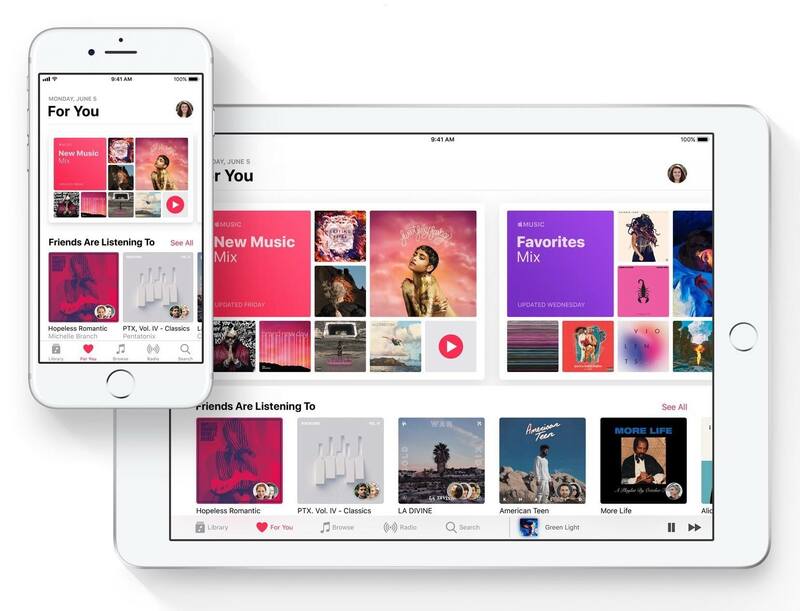 This year, Apple Music subscribers can create a profile so their friends can follow them and see all the music that they're listening to. Friends can also share playlists with each other and see the Apple Music Radio stations they've been listening to. Apple's Home app has remained mostly unchanged, but it has received support for a new category of devices: AirPlay 2 speakers. So far this change seems purely added for Apple's upcoming HomePod devices, but we'll see if other device manufacturers are added to that list over time. Along with the impressive iPad-specific new features added to Notes, the app has also gained the ability to create inline tables. The new functionality is accessible from the shortcut bar above the QuickType keyboard in the Notes app. The Notes share sheet UI has also been updated, now enabling you to browse through your folders, and even search for specific notes before choosing where to save your content. Despite all the new additions in Notes, the background paper texture in the app has survived another year — an unwavering final tribute to the skeuomorphism of iOS 6. Please, Apple... Please take it away. Apple has once again reworked Siri's voices, now claiming that they sound more natural and expressive than ever before. A brand new feature for Siri is its ability to translate between languages. Apple is calling this a beta for now, but the potential of a fully-functioning translator in a phone is immense. Siri also has new integrations with Apple Music, so asking it to play you a song will have a better chance of resulting in something that you will actually like. It can also answer contextual questions about currently playing tracks, such as "Who's the drummer in this song?" Apple is also talking up their machine learning capabilities system-wide, and pushing the idea that Siri is a universal personal assistant, ingrained throughout the fabric of the OS. Better QuickType suggestions, Safari search suggestions, intelligent calendar event suggestions, recommended stories in News, and more. Some of these features are not entirely new concepts to iOS, but Apple seems keener on them this year than last, so perhaps they've finally really pulled it off. Ryan: Ever since the introduction of iOS 7 in 2013, Apple's mobile operating system has yet to see a major overhaul of its user interface. With each version since then, there have been only minor UI revisions, and iOS 11 continues that trend. It contains no substantial refresh, but it does come with a handful of noteworthy iterative tweaks. One of the most immediately noticeable changes in iOS 11 is the spread of certain design elements from iOS 10's Music, News, Maps, and Home apps. The design trend pioneered by those apps made its way into the TV app last December, and also this year's update to the WWDC app, so it's not surprising that iOS 11 further expands that same style. The Podcasts app is the most prominent adopter of this design, closely imitating the Music app now, while in many other system apps the majority of design elements remain the same as before. Certain specific elements though – such as headers and search bars – have changed to help provide a more unified look and feel across the OS. One point of fragmentation regarding notifications is being altered in iOS 11. 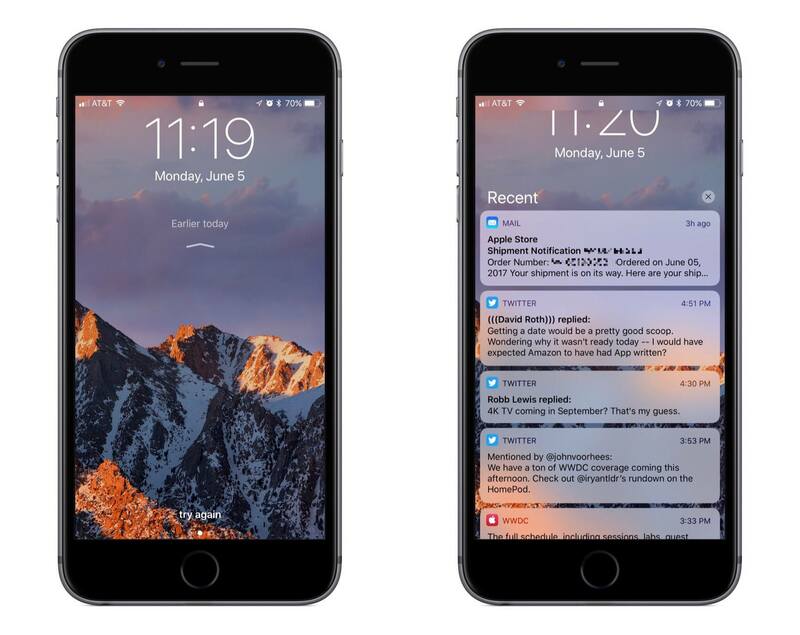 Now when viewing notifications from a device's Lock screen, you can swipe up to load the full list of missed notifications – the exact list you would have previously seen inside of Notification Center. This new Lock screen behavior is the only way to access Notification Center in iOS 11; swiping down from the top of the screen now returns you to the Lock screen, where you can access the Search screen as usual by swiping right, and the Camera by swiping left. This change may bring some initial confusion, but it seems like a helpful consolidation that promotes greater simplicity in the long run. Another feature of the Lock screen I've noticed in my brief usage of iOS 11 is that a card containing audio playback controls will proactively appear on the Lock screen for short periods of time after I've paused playback. This is a small, but extremely useful addition I'm sure to take advantage of every day to restart playback. 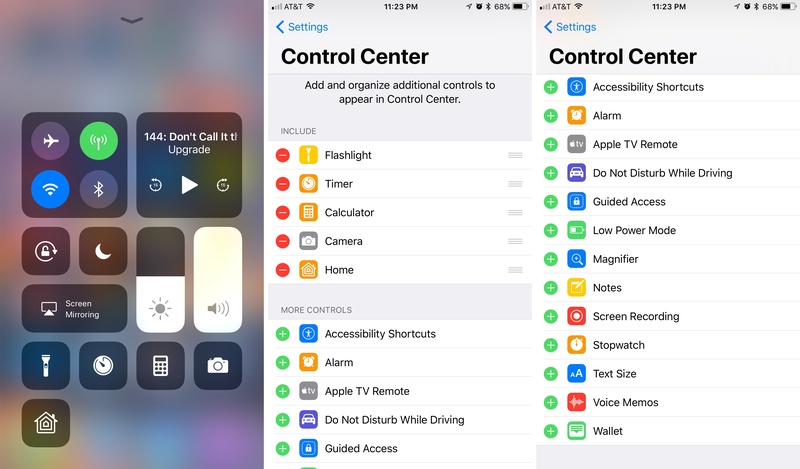 iOS 11 brings two major changes to Control Center, one of which has long been asked for, and the other of which comes as a real surprise. On the hopes-and-dreams-fulfilled side of things, Control Center can now be customized with the buttons and toggles that you care about most. Not only that, but you can also 3D Touch on more objects in Control Center than ever before, and some of those objects expand into a menu with even more buttons in it. The second major change is that Control Center has received a full redesign. Gone are the three separate panels introduced just last year in iOS 10. In their place is a single-paged Control Center that looks and feels substantially different. It is rare for Apple to introduce a whole new interface design just one year after another similarly radical shift, but that's what they've done here. It seems like the best route to go though; iOS 11's update appears simpler and more efficient than before, so it's a welcome change. Alex: While new interfaces and improved applications always get the spotlight, Apple's yearly framework updates and new releases are a category that requires attention as well. These may not be as flashy, but they often represent brand new opportunities for developers to create categories of apps that have never existed before on the platform. Over the coming months and even years, as we see more and more apps released with AR and machine learning capabilities, we'll be able to trace their origins back to the frameworks announced alongside iOS 11 this year. ARKit is a brand new framework from Apple which allows developers to create augmented reality experiences on iPhones and iPads. The framework fuses camera sensor data with CoreMotion data from Apple's M-series motion coprocessor chips to accurately track the world relative to the position of an iOS device. In other words, as you move a device around a room, ARKit is able to track exactly where the device is at any given point, including its orientation. The other main aspect of ARKit is analyzing a room to determine the location of flat planes such as tables or the floor. It can then use these or other feature points to anchor virtual objects in place and make them impervious to the movement of the device. The above two features are among the hardest problems for developers of AR apps to handle, and with ARKit Apple is taking these almost entirely off their plate. Developers of ARKit apps will thus be free to create and build their worlds without having to pay so much attention to the problem of making sure their worlds stay in place in the real world. Core ML is the second brand new framework that Apple announced at this year's keynote. This framework's goal is to expose the power of machine learning to developers without requiring them to build these complex abilities into their apps from scratch. The two flagship features of Core ML are computer vision and natural language processing. Core ML's computer vision functionality supports face tracking and detection, landmark identification, image registration, object tracking, and detection of text, rectangles, and bar codes. On the natural language processing front, the framework will intelligently analyze text and output information about it such as the important parts of speech and other powerful language recognition techniques. Core ML has other features as well, making it easier for developers to integrate a wide variety of machine learning models into their apps and run those models locally on their customers' iOS devices. These aspects of the framework are a bit beyond the scope of this article, but if you're interested you can read deeper into them on Apple's Core ML preview page. Core ML doesn't do all of the work for developers, as they will still need to understand machine learning models well enough to handle the output of the framework's processed data. However, the most difficult part of that work — taking raw data and processing it into something meaningful — can now be handled by Apple. Machine learning may still be a highly advanced field to get into, but Apple has taken the first step toward lowering that barrier to entry with the introduction of Core ML. It will be very interesting to see where they go with this framework in future years. SiriKit was announced at last year's WWDC, marking the first time that third-party developers had an officially supported method of allowing users to interact with their apps via Siri. The main limitation of SiriKit is that Apple only opens it up to a small subset of app types, and unfortunately that fact is not changing this year. Instead, Apple is choosing to continue slowly, ever so slowly, opening the framework to new types of apps. In the latest version of SiriKit, the lucky winners are task lists and note-taking apps. Developers of apps in these groups can now set up Siri integrations so that users can create and manage their task lists or notes using their voices. This includes setting up tasks based on a user's current location, or a specified date. SiriKit has also been opened up to QR code apps, so users can make or request payments, or display their contact information by asking Siri to call up a QR code from a third-party app. Users can also request that Siri scan a QR code for them — after which their iOS device will automatically open the app that the scanned code relates to. Ryan: As with every iOS release, there are plenty of smaller additions to improve the overall experience of the platform. One that will appear among the first iOS 11 changes for owners of new devices is Automatic Setup. The setup process on new devices has grown substantially longer over the last several years, and Automatic Setup is meant to address that problem. It can import many settings, passwords, and preferences on to a new device automatically if you hold that device near an existing iPhone, iPad, or even Mac, making setup experiences quicker and thus more pleasant. A new expansion of Do Not Disturb is designed to help create a safer driving experience. When you first begin driving with an iOS 11-equipped device in tow, your device will suggest turning on Do Not Disturb While Driving. With this feature activated, incoming notifications will be blocked until you've arrived at your destination. It can be configured so that people who message you while you're driving will receive an automated reply letting them know that you're currently driving, and that you will get back to them later. There's even a helpful addition that lets those people message back "Urgent" in case of emergency, and their message will be let through. Another smaller feature is the One-Handed Keyboard, which slides keys over closer to one side of the screen so your thumb won't have as far to reach while typing. iPhones are used one-handed every day, so the addition of a keyboard optimized for one-handed use makes a lot of sense. AirPlay 2 is a major upgrade to Apple's proprietary wireless audio and video streaming technology. The highlight feature of AirPlay 2 is that it enables multi-room audio, so you can control playback through multiple speakers from a single device. iOS 11 brings new and exciting developments to a variety of fronts. Despite the ways iOS has grown in maturity over recent years, Apple has clearly kept investing a substantial amount of resources into continuing a strong development streak. Some of that effort has gone into making the iPad a better PC replacement for power users and the mass market alike. New frameworks like ARKit provide a glimpse into the enormous potential that AR technologies have to transform the way we view the world – and the part our iPhones have to play in that. A number of iOS 11's improvements are subtler, more iterative, but they combine to make the platform simultaneously more capable and easier to use. 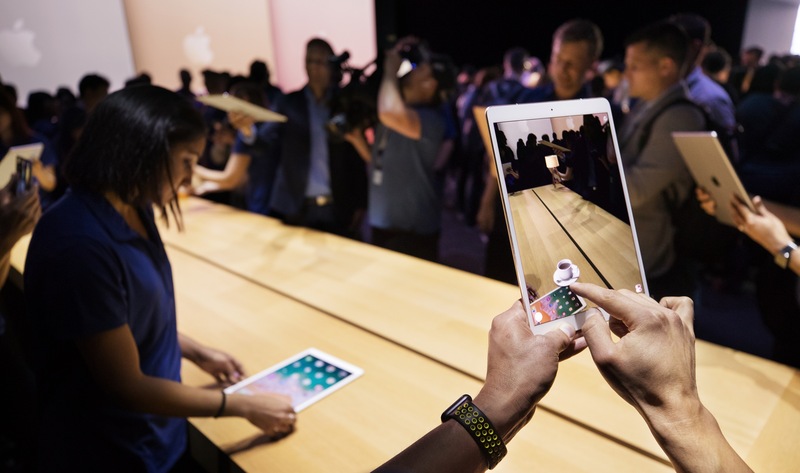 It's no secret that here at MacStories, we're big fans of the iPad. 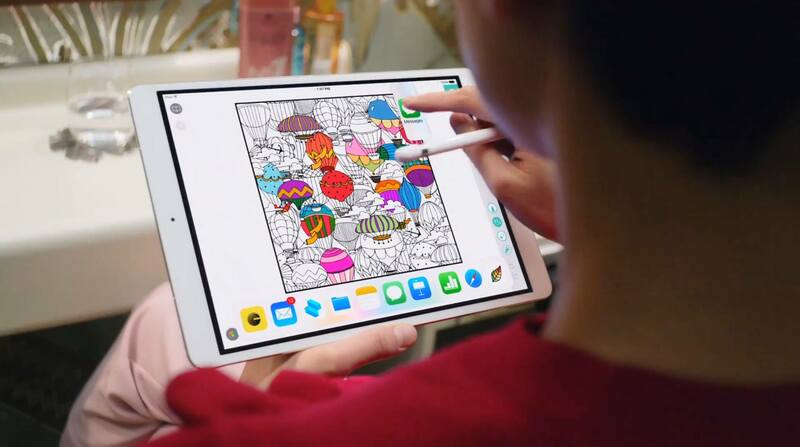 Federico laid out his vision for the future of the iPad last month, and with iOS 11 Apple has delivered on several of the wishes and thoughts he outlined. 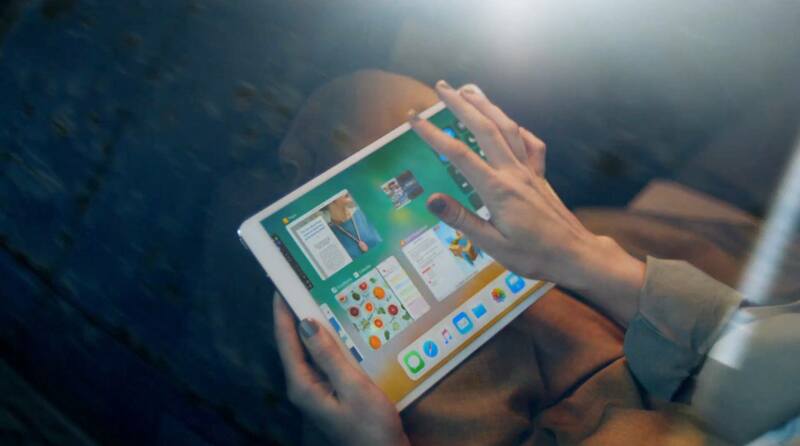 The Dock, App Switcher, and drag and drop solve so many of the iPad's limitations – they make common actions like moving documents or switching apps both simple and intuitive. 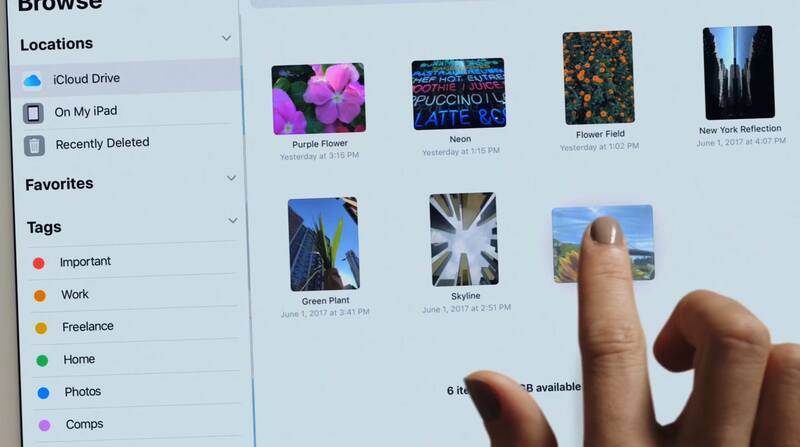 A powerful, unified file management system like the Files app removes one of the major barriers to entry for those transitioning from a Mac or PC into iPad-first computing. 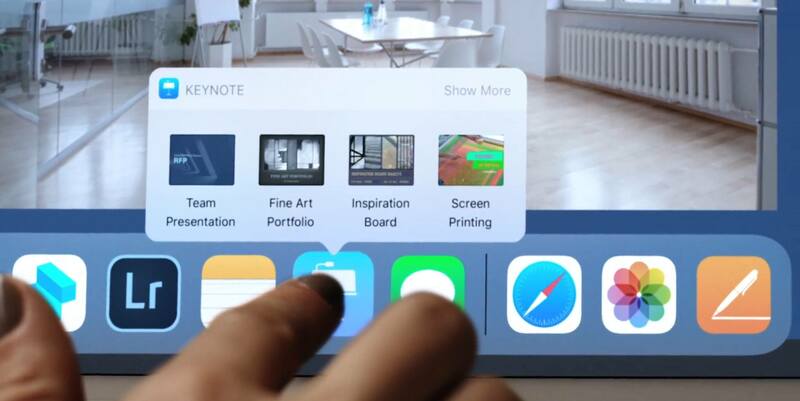 These changes all further weaken the narrative that the iPad isn't built for real work. With another year of major iOS evolution upon us, it becomes more and more evident that iOS is Apple's primary software platform for the mass market – both now, and especially in the future. Despite Apple showing a lot of positive evidence today of its commitment to the Mac, that legacy platform continues to demonstrate signs of morphing into a more niche option for a relatively small set of users – particularly professional users. Hundreds of millions of people use iOS every day on their iPhones, and Apple is making it easier for those same people to adopt iPads as their productivity devices. iOS 11 is the work of a company passionate about developing for iPhone and iPad, and excited about the future those devices will usher us into. How long the current pace of iOS development can keep up is anyone's guess, but it shows no signs of slowing down. If you belong to Apple's developer program, iOS 11 is available as a beta download from the developer portal. The public will be able to download it in beta form later this month, and it will see a worldwide release to all iOS users this fall.